The sun-kissed islands in Tropico 6 look gorgeous. You could just dive into the refreshing blue waters, where dolphins leap from the water and seagulls coast above the sea’s surface. The luscious green foliage and sandy white shores are filtered through a sunny, orange haze. 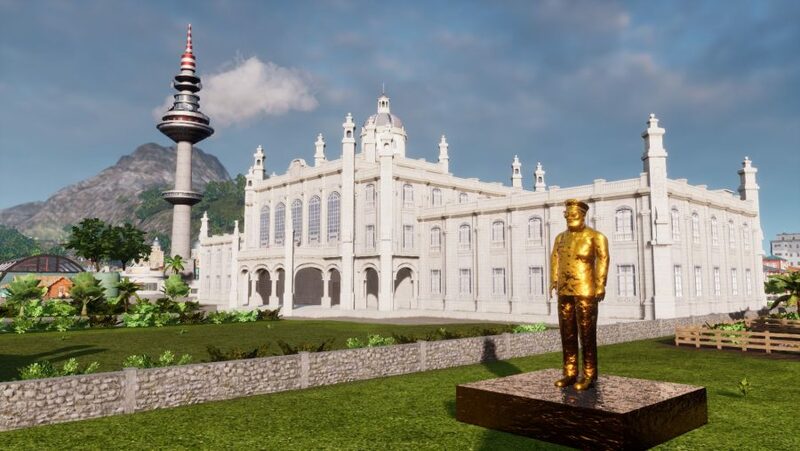 Ruling as a dictator in this venerable city builder can be quite stressful, but the lens flare heavy makeover of Tropico 6 is a soothing balm. The Tropico series always had a flamboyant and luxurious side, ever since its first release in 2001. You won’t be bothered by the freezing tundras of Frostpunk, or the high stakes of survival in Surviving Mars. It’s all sunshine, cigars, and political high jinks in this city sim. Even from the menu screen it’s obvious that Tropico has had a major glow up since its last iteration. “When it comes to graphics there was quite a big difference moving to Unreal Engine 4,” senior Limbic Entertainment level designer Mark Mussler tells me. 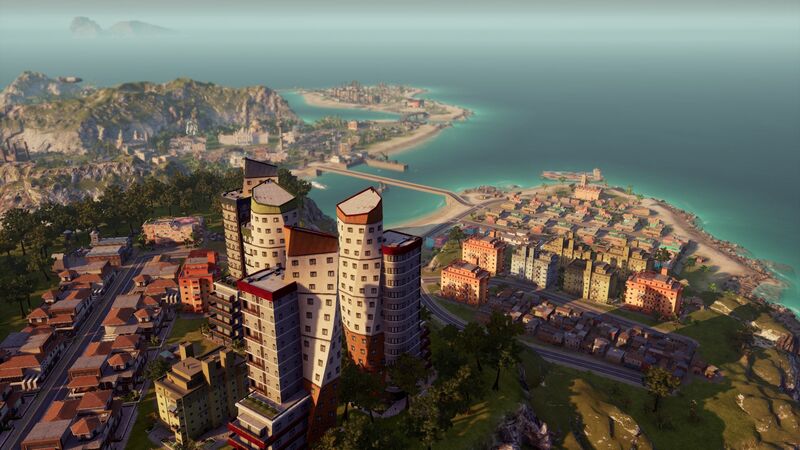 But in Tropico 6 it isn’t all about soaking in those visuals and living the high life. Looking a little closer at the city, the orange haze seems to be emanating from the nuclear power plants that are pumping out smoke. 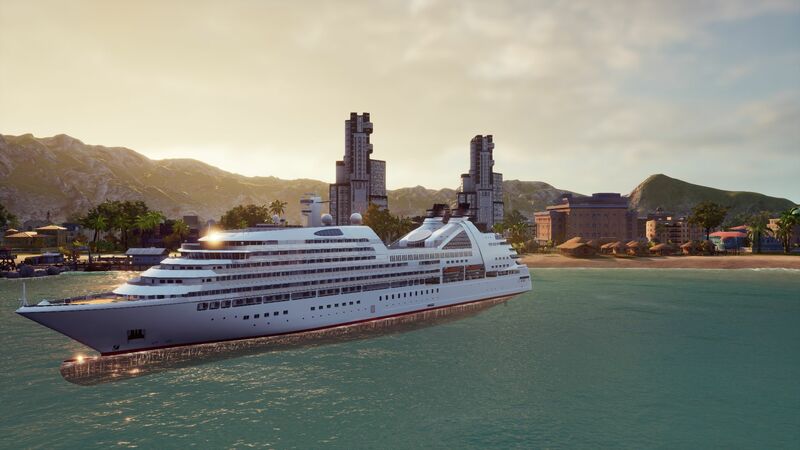 That’s the crux of Tropico 6 – building an industrial and economic empire against the gorgeous Caribbean backdrop, pumping smog into the sunscape. With a new playground comes new toys, and Limbic has introduced new transportation and infrastructure mechanics to help you navigate these islands. Tropico 6 includes the ability to build bridges so you can expand your working empire across the seas. Public transportation is a key feature, too. “We can build a bus station that allows me to define a starting point and an endpoint,” Mussler explains. “The player can control how the Tropicans navigate from one place to the other.” Perfect for the dictator who likes to micromanage. It’s not only Tropicans who can move around more freely – you can also extend into other areas of the island. 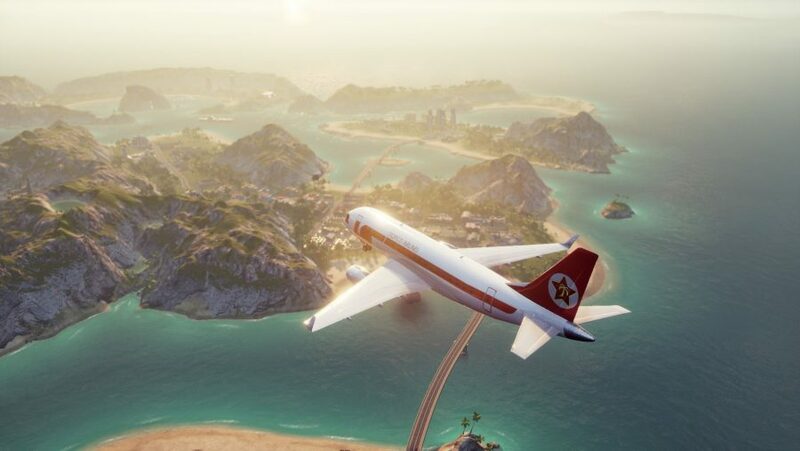 Tropico 6 allows you to build on new elevated landscapes and reach different parts of the island. Cable cars now give you the ability to build on higher ground, and tunnels allow you to build on the other side of an island without having to worry about efficiency times. Mastered city sims? Try your skills in other industries, bringing order to hospitals, farms, and theme parks. Check out our best management games guide to help you choose your next project. Along with the new transport items and accessories, Limbic has introduced raid buildings. These allow you to send out pirates to plunder the seas and gain resources for your islands. And you can plunder more than pineapples and rum. When you send out your pirates to get a monument, they come back flying in helicopters, carrying the world wonders via wobbly steel cables and then drop the monument onto the map mid-flight. “China’s Temple of Heaven increases the efficiency of all plantations,” Messler explains. The temple would then come in handy if you had a map that focused on, say, pineapple plantations to maintain your economy. Although some of the world’s most famous monuments are under copyright, one that isn’t is the White House. Stealing the White House grants you a decrease in edict costs. You can place it next to El Presidente’s palace as a flex move as he gives his speeches. The new Tropico dev seems to be paying close attention to what fans would like to see return to the series alongside El Presidente’s speeches. As such, Tropico 6 is shaping up to be one of the best in the series. It certainly takes the prize for looking the best. You can finally give El Presidente the palace he deserves, on the highest peak on any of the islands, next to an active volcano, with the Statue of Liberty tastefully placed on the front lawn.